Having spent quite a bit of time in Asia, I’m intrigued by Eastern cultures and landscapes. Song of the Silk Road immersed me in both. On the surface, the concept of a young girl receiving a lucrative offer from an unknown aunt seems contrived, and while Lily was still in New York (the initial 20 pages) I worried I wouldn’t be able to see past that. In hindsight, I believe what bothered me was that my Western mind could not think in Eastern ways until I was taken out of a world I understood and plunked into one that couldn’t be more foreign. Once in China, even monumental coincidences, such as Lily finding Alex, come across as preordained destiny. The prose is sensual and mesmerizing, Lily is courageous, secondary characters such as Lop Nor are fascinating, and the desert landscape provides the reader with a wonderful escape. As a girl growing up in Hong Kong, Lily Lin was captivated by photographs of the desert – its long, lonely vistas and shifting sand dunes. Now living in New York, Lily is struggling to finish her graduate degree when she receives an astonishing offer. An aunt she never knew existed will pay Lily a huge sum to travel across China’s desolate Taklamakan Desert – and carry out a series of tasks along the way. Powerful and eloquent, Song of the Silk Road is a captivating story of self-discovery, resonant with the mysteries of its haunting, exotic landscapes. 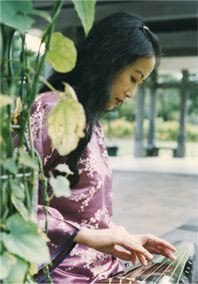 Mingmei Yip was born in China, received her Ph.D. from the University of Paris, Sorbonne, and held faculty appointments at the Chinese University and Baptist University in Hong King. She has published five books in Chinese, written several columns for seven major Hong Kong newspapers, and has appeared on over forty TV and radio programs in Hong Kong, Taiwan, Mainland China, and the U.S. She immigrated to the United States in 1992, where she lives in New York City. WWW: There’s a vivid sense of place throughout much of Song of the Silk Road. Have you traveled to some of these places? MY: Yes, I traveled there a few years ago with my husband. Although the routes are no longer deadly, traveling there is still arduous, with vast deserts, steep cliffs, and rushing rivers. But it’s worth it to be able to see the exquisite Buddhist frescoes and statues from a thousand year ago, still looking fresh today. WWW: Qi is an important concept in the novel, and one many Westerners may be unfamiliar with. Can you explain what it is and its importance in Chinese culture? MY: The concept of qi existed in China as early as 2,500 years ago. The word means vital energy, the cosmic breath that keeps the universe thriving. Chinese believe if we practice to activate this life breath, which is basically the interaction and balance of the yin and the yang, we can attain longevity, even immortality. WWW: At first Alex seemed like an appealing stalker, and then I found myself infatuated. At the end of the novel I realized that I still knew little about him and he remained a bit of a mystery, yet I didn’t mind. Was this intentional? MY: I like to make my main characters a bit mysterious, especially when there’s love involved. Because romance only thrives with a challenge. WWW: Who was your favorite character and why? MY: My favorite character is Alex. I tried to show his innocence, stubborn persistence, youthful naiveté, and raw energy – traits unlikely to be found in mature people who have been contaminated by the “wind and dust” of the world. WWW: Novels aren’t the only thing you’ve written. Can you tell us about your children’s book? MY: My first book for children is Chinese Children’s Favorite Stories. I retold 13 traditional stories and illustrated them with paintings that used a mixture of Western and Chinese colors. Now I’m working on a second children’s book that Tuttle will publish in 2012. WWW: I understand that you aren’t only a writer, but an artist and musician as well. Can you tell us about that? MY: I am a professional musician of the qin – ancient Chinese stringed instrument. Recently I was invited by Carnegie Hall to play. I do eight to ten concerts a year and also teach calligraphy workshops at museums, universities, high schools, cultural organizations and libraries. WWW: Are you working on another novel now? MY: Yes, my next novel is Skeleton Women, the story of a woman spy set in 1930s Shanghai, also to be published in 2012. Thank you for joining us today, Mingmei! Song of the Silk Road is available in bookstores everywhere. Oooh! Sounds interesting. I think I'll recommend this one to my book club. It is a very enjoyable book - and very different!